Have you or someone you know attended a recent archdiocesan event? Or have you seen a photo in our newspaper that you want a copy of? 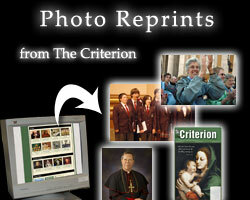 Or perhaps you would like an image of the archbishop for your home or business. If so, you've come to the right place. Note: Due to a staff shortage at The Criterion, we are currently unable to process any photo reprints for the time being. Our reporting staff takes high-quality photos at many major archdiocesan events -- the types of events that either have historical significance (like the canonization of St. Theodora in 2006) or that your family might have attended (like an ordination at the cathedral). We are now making select photos available for purchase through our website -- you can order a professional quality print in one of four sizes from a 4" x 6" to a large 13" x 19". And it's more than just events -- we also have photos below (under "Standard Images") that you may wish to have for your household, such as a portrait of Archbishop Daniel M. Buechlein or an image from SS. Peter and Paul Cathedral. Finally, we are making available full-size prints (11" x 17") of Criterion front pages, both those from major events and our artistic Christmas and Easter covers. So click on the photos below to begin shopping: either purchase one image at a time or select several images that you want. And if you can't find it, place a special order below. In trying to keep out costs low, we are operating this new feature entirely in-house. If our forms are confusing, don't forget to look at our sample form or contact webmaster@archindy.org. Is there an image you want that is not listed on this site? Perhaps its something from a few years ago that you saw in The Criterion, or a front page with a family member on it. Whatever your need, we'll help you fill it. Send us a message using the form linked to below, or e-mail webmaster@archindy.org, and we will try to find the image or front page that you need. The pricing for a custom order is the same as all the regular orders that you can place using the galleries above.